Dental bridges are used to fill the gap between teeth and effectively replace a missing tooth. Missing teeth can make it difficult for a person to speak, eat or bite down properly. In addition, missing teeth can lead to bone loss and change the shape of the face. A dental bridge consists of a false tooth, which is referred to as the pontic, and the patient’s supporting teeth which are called abutment teeth or dental crowns. The pontic is fused to metal and anchored to the adjoining teeth in order to create a natural-looking tooth. Together, these elements can benefit a patient by improving their self-confidence, restoring their smile, improving functionality and preventing their facial structures from prematurely aging. Traditional Bridge – The most common type of bridge used. 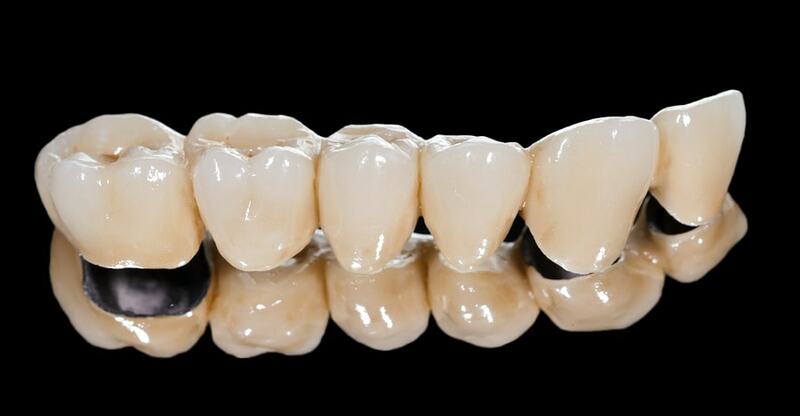 With this bridge, a dental crown is created for each abutment tooth with a pontic in-between. To create a crown, the dentist must recontour the natural teeth by removing some of the enamel. The space created allows the crown to fit over the patient’s abutment teeth. Cantilever Bridge – This type of bridge is often created when the patient is missing two consecutive teeth. The abutment teeth are prepped for the crown and the pontic is attached on the end. Maryland Bridge – A more cost-efficient alternative to the traditional bridge. The pontic is attached to metal wings and the wings are cemented to the abutment teeth. The cost of dental bridges can range from $500 to $1200 per tooth. The final cost depends on the type of bridge utilized by the dentist, material used, fabrication process, complexity of the placement and any additional treatments needed. If that price seems too expensive for a patient’s budget, they should check with their dentist as there are various options of how to pay for dental work. Taking care of dental bridges is not difficult and is similar to caring for natural teeth. Patients should brush their teeth at least twice a day and floss daily. However, patients will need to use a bridge threader to properly clean under the pontic. Bridge threaders help eliminate plaque and ward off gum disease. Some patients find a waterpik works just as well as floss and can be easier to use in areas which are difficult to floss. Some patients prefer an implant bridge if they have consecutively missing teeth. An implant-supported bridge does not rely on support from the surrounding teeth. Instead, the dentist will embed a small titanium post directly into the gum and jawbone for each missing tooth. An abutment is secured to the post with a tiny screw. The crowns are connected to each other to form one piece which is fused to the abutment. Implant-supported bridges provide patients with realistic and sturdy tooth restoration. Bridge-supported implants require the same oral care as traditional bridges. However, this type of dental procedure can be time consuming and very costly. Since the procedure for implants is done in phases, the final price can vary with a single implant costing a patient between $1000 and $3000.